Prenatal surgery is an invasive procedure performed on a fetus (name given to unborn young from the end of the eighth week of development through birth). An invasive procedure is one in which the fetus is penetrated by an instrument. The first successful fetal operations were carried out in the 1920s on various animal subjects. Surgical experiments continued for the next four decades. The first human fetal surgery was performed in the 1950s. It involved a blood transfusion to a fetus with a condition called "Rh incompatibility." In this condition, the fetus's Rh-positive red blood cells are destroyed by its Rh-negative immune system. Ultrasound imaging was developed in 1977. Ultrasound devices bounce soundwaves off an object and draw a picture based on how deep the sound waves go. The ultrasound provides a photographic image of the developing fetus, making practical the procedure known as amniocentesis. In amniocentesis, a hollow needle is inserted through a pregnant woman's abdomen into the amniotic sac that surrounds the fetus. A sample of amniotic fluid is removed and examined for evidence of genetic abnormalities like Down's syndrome. 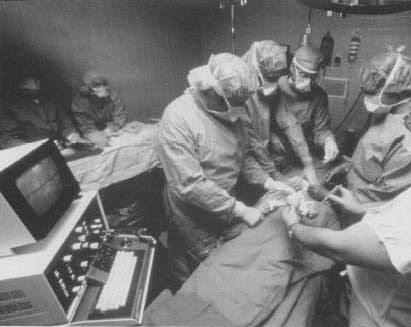 Doctors perform prenatal surgery on a fetus with hydrocephaly, a congenital condition in which an abnormal amount of cerebral fluid in the skull puts extreme pressure on the brain. the mother's incisions were patched with GoreTex. The baby was born seven weeks later, premature but healthy. Prenatal surgery remains in its earliest stages of development. The success rate is not yet high. Some of the procedures with higher success rates include amniocentesis and the bladder shunt performed by Harrison. The risk remains high for both fetus and mother. One surgical technique that has exciting possibilities is fetal stem-cell transplantation. This involves injecting stem cells, the earliest precursor of all blood cells, from a dead fetus into a live one. This provides the living fetus with healthy genetic material to overcome defective genes of its own.